by Romney, Marshall B.; Steinbart, Paul J. For undergraduate and graduate courses in Accounting Information Systems (AIS). 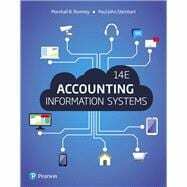 Accounting Information Systems, 14th Edition covers all of the most recent updates in AIS, including how developments in IT affect business processes and controls, the effect of recent regulatory developments on the design and operation of accounting systems, and how accountants can use the AIS to add value to an organization. Not only will readers see how AIS has changed the role of an accountant, but they’ll also be prepared for a successful accounting career in public practice, industry, or government. Marshall B. Romney is the John and Nancy Hardy Professor in the Marriott School of Management at Brigham Young University. He holds a Bachelor's and Master's degree from BYU and a PhD degree from the University of Texas at Austin. Marshall has published 10 different books and over 100 articles in academic and professional journals. He is the recipient of eight research grants. He has taught for or consulted with over 50 different organizations. Marshall is a past president of the Information Systems section of the AAA. He was a member of both the Information Technology Executive Committee and the IT Practices Subcommittee of the AICPA. He was the chairman of the Information Technology committee for the Utah Association of CPAs, who presented him with the outstanding chairperson award. At BYU, Marshall is the Chairperson of the Information Systems Department and is the director of both the graduate and undergraduate Information Systems programs. Paul John Steinbart is a Professor in the Department of Information Systems in the W. P. Carey School of Business at Arizona State University where he teaches graduate courses on information security and an undergraduate course on accounting information systems. His research interests include issues concerning the usability of information security solutions, individuals’ information security behaviors, effective governance of information security, and the effects of information technology on decision making. He has published his research in leading academic journals such as MIS Quarterly, Information Systems Research, the Journal of the Association for Information Systems, Decision Sciences, and The Accounting Review. He is also the co-author of the undergraduate textbook Accounting Information Systems published by Prentice-Hall. Steinbart also serves as the ISACA Academic Advocate at Arizona State University.